Juicy, incredibly tender meat that falls off the bone and is packed with flavor. Line a large baking pan with aluminum foil-set aside. Preheat oven to 200℉. Cover all sides of ribs with dry rub. Place 1 drop of liquid smoke in each of the four corners of the pan. Cook at 200℉ for 6-8 hours. Smaller racks will be done after 6 hours. 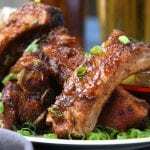 Larger racks of ribs, racks that are still slightly frozen will require or if cooking uncovered will require up to 8 hours and possibly a little longer.